The first issue of Patsy Walker; AKA Hellcat is a comic I have been waiting on for months. I’ve had the promo postcard on my nightstand since I grabbed it from my LCS, and I would be lying if I said I wasn’t up late googling pictures of the teaser art. It’s FINALLY here and let me tell you, Internet, it does not disappoint. It may have snuck in just at the end of 2015, but this book arrives with a strong, hilarious, gorgeous first issue that easily places on my top 10 list for the past year. Hellcat most definitely had me at Hello. The first page delivers everything I was hoping this comic would, and more. Patsy being adorable in cat-themed outfits, amazing art, cute jokes. That was the “everything.” The “More” is SHE-HULK. It’s no secret that I have a huge crush on the mean, green, strong female character that is Jennifer Walters, and this book is a fantastic place for that love to be rekindled. That’s just the first page…somehow, the rest of the book is even better. Patsy has been through a lot of changes in the past few years- she’s not a gritty Superhero, and she’s not the little girl her Mom wrote about, either. Right now, like so many other heroes and mutants, she’s just trying to get by. With the help of some powered, de-powered, and not-so-powered friends, it seems like she might be able to make things better for a lot of people in her position. Kate Leth was destined to write this book. Somewhere, in the sands of time hundreds of years a go, a wise woman prophesied that a phenomenal writer would bring Patsy Walker to an all-ages audience and still manage to keep her awesome, and lo, Kate Leth was born (and hired by Marvel). From her work on Edward Scissorhands and Adventure Time to her quippy and mostly-autobiographical web series, Kate or Die, Leth consistently delivers humorous and relatable scripts that are engaging and innovative. As she states in the creator’s notes in Hellcat, all-ages comics aren’t solely for kids; they’re for a wide network of fans and can be enjoyable for everyone. She hits that right on with Hellcat. The first issue is welcoming to readers of all ages and feels very warm, inclusive, and positive. The only thing that might rival the fantastic script and plot of this first issue is the beautiful, expressive, wonderful art. Brittney L. Williams draws pretty pictures (even when she’s drawing someone else’s bad drawings: see page 1). Her art complements the feel of the book perfectly. Patsy and her friends are all realistic and fun, even when they’re green. The cat-like appearance of Hellcat is a sweet nod to the development of the character, but not over the top, and the chibi-inspired moments of joy are unbelievably cute. It’s obvious that Leth and Williams’ previous work together on Secret Wars Too #1 had a positive impact on their collaborative relationship as the art and script seem to be made for each other (which they were, but we all know that too often in comics it doesn’t seem to be true.) Williams’ art is augmented beautifully by the work of colorist Megan Wilson. The colors are bold and modern, but the strong pastel tones and fields of solid, bright color keep it feeling friendly and vibrant. The dynamic color, vibrant art, and simple, vivid blocking results in a book that reads more like a cartoon storyboard or a great web-comic. Overall, this book was fantastic. I can’t recommend it enough and it is going to be so exciting to read the rest of this arc. Patsy Walker easily joins Marvel stand-outs Ms. Marvel and the Unbeatable Squirrel Girl, as well as indie titles like Nimona and Lumberjanes, in the recent movement to make all-ages comics great, relevant, and attentive to a wide variety or readers and interests. Kate Leth and her team have done something incredible with this book; combining superhero, slice of life, and magical girl comics into one fantastic new idea. If you’re not already picking up a copy for yourself, your kids, your friends, and your cat, you probably should be. 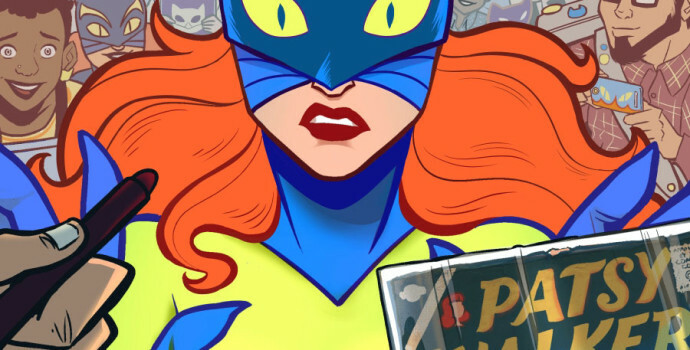 Patsy Walker; AKA Hellcat #1 was released on December 23rd and is available at your Local Comic Shop.